WRITTEN BY: Jennifer Lee (screenplay & story), Chris Buck (story), Jennifer Lee (story), and Shane Morris (story) and Hans Christian Andersen. After some hibernation, Pixar which reigned supreme in the world of animation, is back with a bang after the hit of Tangled in 2010 and Wreck-It Ralph. Now it is ready to give to the world its newest creation “FROZEN”. 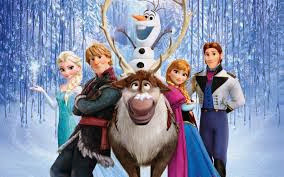 It is yet another Disney’s best animated feature film inspired by “The Snow Queen” by Hans Christian Andersen. It is the story of two princesses of Arendelle – Elsa is the eldest and soon-to-be Queen, where as Anna is the youngest and is free-spirited and is naughty , with a good balance of humor and sentiments. In the early age, Elsa and Anna are the best of friends, but by accident when Elsa’s ability to conjure ice and snow almost kills her sister their relationship is put in jeopardy. Elsa conceals her powers from her sister fearing that she might hurt her even more. After many years, Elsa comes out of her hiding, but on that day she is made to run from the castle named as a sorceress because she accidentally turns Arendelle’s summer into an eternal winter. This story is simple and does not have any kind of bad guy to beat, but has a hell bent on destroying someone or something. It clearly tells us how we should come together and find something positive in our differences and to accept people for who they are.This movie does not have big name actors supporting roles, which is done many times just to attract audience attention. The Director has mainly focused on the story line. Frozen is not that kind of a complicated movie. It keeps everything very simple, and is very identical to a storybook –style telling that prefers to briskly move through the narrative rather than lingering on moments for too long. But this seems kind of out dated and boring, but it simply suits this movie. There are some minor villains whose appearances are kept simple so that children are engaged. That dosent mean that the adults will be left bitting their thumbs as there are a few surprises and events of legitimate tension. The films strength is laid on the characters. This movie has some good scores of music like the one Elsa sings – Let It Go, which is written by Tony Award-winning duo Robert Lopez and Kristen Anderson-Lopez of “Book of Mormon” fame, which is definitely a knock-out moment. The animation, the song, Menzel’s voice and the entirety of that four minute segment is quite unique and power packed, as it beats to the film’s thematic heart. On the whole, Frozen may be too simple for boys and adults, but the younger girls will surely fall in love with the movie. But there are enough incidents that would keep everyone in theater engaged, like the comedy and the serious moments of tension as well.